The RV garage portion of this combination garage has a fourteen foot high ceiling accessed though a twelve foot high by twelve foot wide overhead door. The double car garage has a nine foot high ceiling with a sixteen foot wide by eight foot high overhead door. The single car garage has a nine foot high ceiling with an eight foot wide by seven foot high overhead door. The covered porch double doors open into the ample workshop with a nine foot high ceiling and contains a conveniently located powder bathroom. The workshop provides double door access to both the RV and double car garage areas to facilitate easy equipment movement between units. The single car garage is dedicated to the second level apartment which is accessed through the rear entry. The apartment office overlooks the lower vaulted ceiling entry and boasts a skylight. The remaining apartment area has an eight foot ceiling. The versatile open concept great room is natural lit with a front facing window wall. Plans are designed with a concrete slab foundation plan. Question: I like the dimensions and look. I will build this if I can figure out a way to open the single car garage into the two car bay. Have any idea what size beam is required to eliminate the load bearing all separating the three garage bays? Will I need to have a vertical post under a beam? Answer: The wall between the single car and the double car garages is a load bearing wall supporting the second level floor joists. You could easily open this wall location and support the second level floor joists with a beam. The beam size would depend how much of this wall location you would want to remove. If you wanted to remove the entire wall it may be more economical to have a post in the middle (or two posts approx. 4’ to 6’ in from either end) to reduce the size and cost of the beam required for that length. Answer: Sorry it is too difficult to provide an answer as to building cost, as the price varies due to many factors. A local builder, realtor or retail lumber yard contractors’ desk can probably provide you with a building cost estimate based on your specific geographical location. 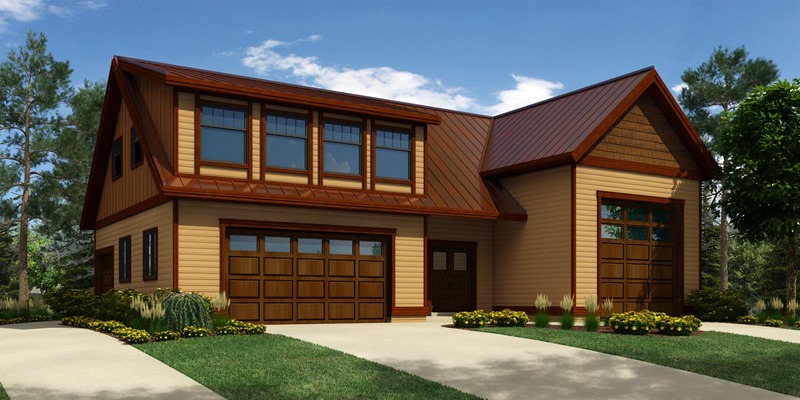 You can purchase a material list from FamilyHomePlans, which lists all the materials needed to construct this garage, (but without a pricing component) and have a local lumber retailer provide you with a materials pricing estimate. RV Garage - 740 sq. ft. Double Garage - 504 sq. ft. Single Garage - 264 sq. ft.
Workshop - 216 sq. ft.